A. Not exactly. Rather, CMOS encourages users to apply its guidelines with flexibility and common sense. When rules bump up against each other, try to think like an editor. “First Lady” is conventionally capped as an honorific because its meaning isn’t always clear if it’s lowercased . . . . In your sentence, paired with “the president,” “first lady” may be safely lowercased, since confusion is unlikely. In your paired examples, treat both titles the same, whichever style you choose. Q. Please help me! I am arguing with my publisher. I say that back seat is correct, and she says it’s backseat. Please tell me which is correct, and thank you. A. A publisher and a writer who between them can’t find a dictionary? Merriam-Webster’s Collegiate Dictionary (11th ed.) says backseat. Some of the scenarios and exchanges are laugh-out-loud funny; others are compelling in a different way, at least to editors and their obsessive ilk. The book just about tops 100 pages, and my sole complaint is that it’s too short – I’d have devoured a book twice this size and wished for more. Luckily there’s the monthly Q&A. 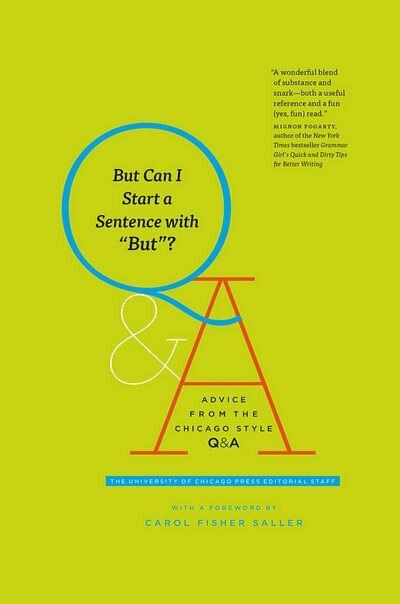 If the Chicago editors’ But Can I Start a Sentence with “But”? sounds like your thing, or the editor in your life’s thing, you can order it from University of Chicago Press or your preferred bookshop. This entry was posted on Wednesday, July 20th, 2016 at 6:56 pm and is filed under book reviews, books, editing, writing. You can follow any responses to this entry through the RSS 2.0 feed. You can leave a response, or trackback from your own site. 9 Responses to Book review: But Can I Start a Sentence with “But”? It’s a great book/text/guide. I’m on the road so bought it in an e-book format. People think I am weird as I get a lot of laughs from it: from a text book? Usually I e-book crap novels (or not so crap), so it is a pleasure having something like this in my back pocket. I don’t agree with everything, having been brought up on a different style guide, but it is a pleasure to read. I agree, CMOS is a pleasure to read – as are many style guides and manuals. The Oxford Manual of Style is my usual default in BrE, and it too is surprisingly entertaining at times. Surprising, at least, to newcomers, since these reference books look so dry and pernickety at first. Have finished reading it. It is a hoot! When you are reading a newspaper or a physical book in public, and laugh out loud, it’s kinda accepted. But reading Kindle? I suspect people think I am reading Facebook, or something. But CMOS? Laughter? I suspect I would be jailed! I’m going to purchase this for the entertainment value alone. (But also to feed my inner-geek). Enjoy, Grumpy. I think it will satisfy on both counts. But language evolves. Usage rules. Init? Which is one reason CMOS is now in its 16th edition.